I often have a love-hate relationship with my Giada De Laurentiis Everyday Italian cookbook. Some of the recipes are very straight forward and simple like this one and some have a laundry list of ingredients that include pricey fresh herbs. I of course substitute with my trusty dry ingredients but, Giada, not all of us live in California where the weather is constantly warm for growing fresh ingredients. Not all of us have perfect hair and make up and low-cut shirts when we are posing for a photo while bending over a boiling, steaming pot of pasta. 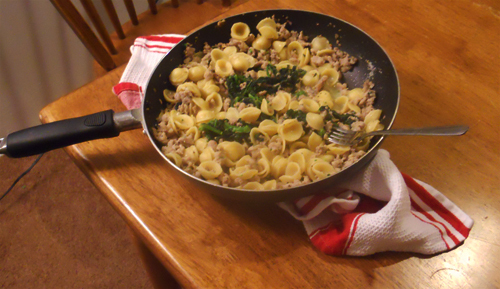 That being said, the Orecchiette with Turkey Sausage and Broccoli Rabe recipe has a simple ingredient list and it only takes about 30 minutes. Perfect for a week night meal and there are plenty of leftovers.